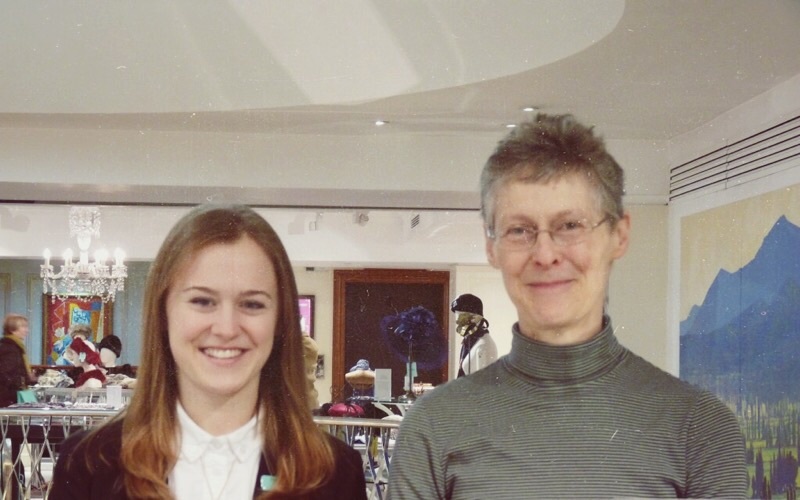 Some time ago, I had the pleasure to speak to Grossmith owner Amanda Brooke and her daughter Kate Brooke at Fortnum and Mason in London. Entering Fortnum and Mason felt like travelling back in time 50 years or more. It was quite a pleasant and very English experience. We talked about Floral Veil and all other Grossmith fragrances. Grossmith consists of Four collections, the Classic Collection, the Royal Collection, the Black Label Collection and the precious Baccarat Collection. The Classic Collection has three fragrances Phul-Nana, Shem-el-Nessim and Hasu-No-Hana. The Royal Collection consists of Betrothal and Diamond Jubilee Bouquet. The Black Collection has Floral Veil, Amelia, Saffron Rose and Golden Chypre. What impressed me most about our meeting was Kate’s and Amanda’s openness and kindness. They were not only very honest about their daily experiences of owning a perfume house and selling perfumes but they were also genuinely interested to know and meet their customers. Amanda Brooke told me their clients want to know the notes in a perfume so they have little displays of them on their counter. 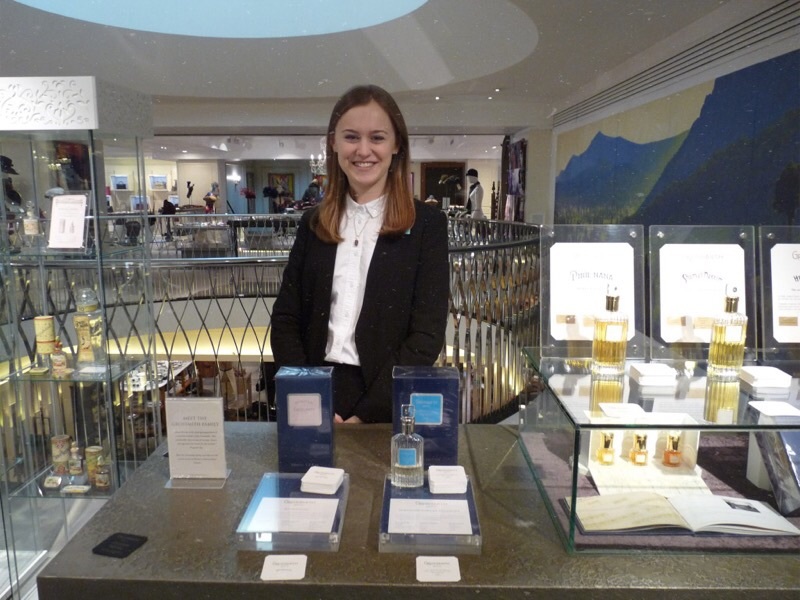 Kate Brooke works at Fortnum and Mason at the Grossmith perfume counter. They also shared some irritations like people asking for samples without knowing their fragrances and people carelessly overspraying their fragrances before their counter. Speaking to them I understand their irritation as so much effort and money gone into their fragrances. While explaining and showing me their fragrances, their eye for details struck me. Everything has been thought through very carefully from packaging to bottles, to counter, to little sample boxes with an included blotter. The complete packaging is made in the UK. It looks and feels quite luxurious, especially their boxes. The design of the bottle and packaging of the Black Label Collection was created by their daughter Eleonor Brooke. When asking Amanda about the inspiration for the name Floral Veil she explained that it was the veil on the hat of her mother. But everyone has his/her own idea about a veil, depending on his/her cultural tradition. A floral veil might refer to a wedding veil as well. All names for the new Grossmith fragrances are created by the Brooke family. 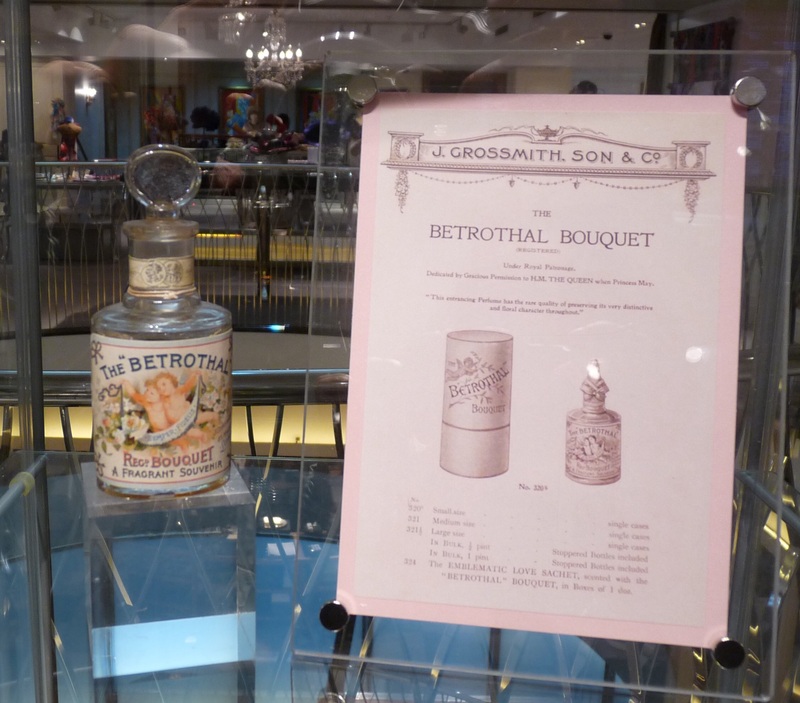 Grossmith was originally founded in the City of London in 1835. Hasu-No-Hana was originally introduced in 1888. In 2009 Hasu-No-Hana was re introduced by the Brooke family giving the French fragrance house Robertet carte blanche financially to recreate this fragrance together with Phul-Nana (1891) and my personal favorite Shem-el-Nessim (1906). Kate Brooke told me Phul-Nana had been used as a verb as well, to get Phul-Nanad, to get well dressed to go out. 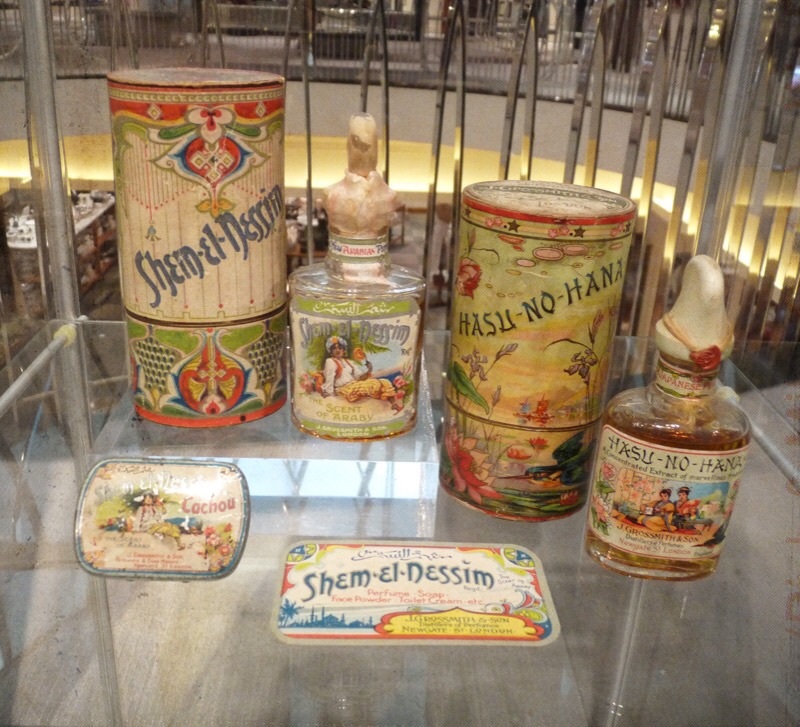 A tin of Phul-Nana face powder produced in WW II can still be seen in the Museum of London. I will not go into too much detail about the Grossmith history as the article will become too long but if you are interested, can read their fascinating story in Scent by Descent in The Telegraph. Or you might like to watch their story in the BBC 4 series Perfume, part 3, The Smell of the Future. The Perfume Lounge, Amsterdam, has very kindly offered a 2 ml sample of Grossmith Floral Veil for a give away. What do you have to do ? Follow L’Esperessence on Twitter, Instagram, via mail or WordPress. Tell us how you follow in your comment. The winner is anounced in a separate post, you will be contacted by mail. Please keep a close eye to your mail ! Special thanks go to The Perfume Lounge, Amanda and Kate Brooke from Grossmith London. Do you know Grossmith fragrances ? If so, which one is your favorite ? And why ? Tell us more ! Hi Esperanza. I’ve just subscribed to your blog and followed you on Twitter. I think I’d love the Classic Collection. especially Shm-el- Nessim. Thanks to you and the Perfume Lounge! Thank you for subscribing, Mary. Shem-el-Nessim is wonderful ! What a lovely article about Grossmith. I became a fan after I had seen the BBC series. The way they dusted and wrapped the bottles was so caring and unusual! ( with white gloves!) I was so intrigued that I had to smell these perfumes. I visited The Perfume Lounge and there and then a fell in love with Grossmith! I had to save up for a bottle of Hasu-no-Hana and I feel rich, owning a bottle now. I also have a decant of Shem-el-Nessim, but Hasu-no-Hana is my favorite. Thank you, Debbie. THE BBC series is wonderful. I can’t remember THE dusting but can imagine they would do That as so much care is given to THE whole process of producing their fragrances. Thanks for sharing your experience with the Grossmiths, they always did come across as genuine and nice. I only know the classic collection, and own a bottle of Shem-el-nessim, which I love. I couldn’t agree more on the beauty of the bottle and packaging. I wasn’t going to enter the draw, thinking that that wasn’t why I wanted to comment, but actually I never tried the black collection and am very curious so why not? 🙂 I follow via email. Thank you, Asali. They truly are genuine and nice. Shem-el-Nessim is my personal favorite as Well. Floral Veil is worth a try as is THE whole Black Collection although I prefer THE Classic collection personally. Thank you, V. They truly are superb ! That is wonderful. Fazal ! A coffret of THE extraits. Such a treat ! Hello. I follow you on twitter (@silvialleida), instagram (@pinxo_ ) wordpress (@merlinasil) and mail 8silviaf…@gmail…). I don’t know all Grossmith fragances but I have fallen in love with Shem el Nessim . This one is my favourite among so many others. A must! Hi! Following you on Instagram and enjoying your blog. Quite the newby to the world if fragrances…discoveries every day, reading and learning 🙂 I’m not familiar with any of the Grossmith fragrances but do have a fondness for the traditional houses. I’m very intrigued by Hasu-no-Hana.